The Honorable Patrick J. Murphy (former Undersecretary of the Army) displays his Steel Hearts bracelet at USMA Class of 2019's Yearling Winter Weekend, honoring the lives of CDT Brandon Jackson and CDT Tom Surdyke. Class of 2019 cadets, friends, and family...we are happy to announce that the Jackson/Surdyke memorial bracelet is now available for purchase on our website. If you missed the opportunity to order one for Yearling Winter Weekend, please consider purchasing one to help us honor their legacies and raise money for each of their respective charities. 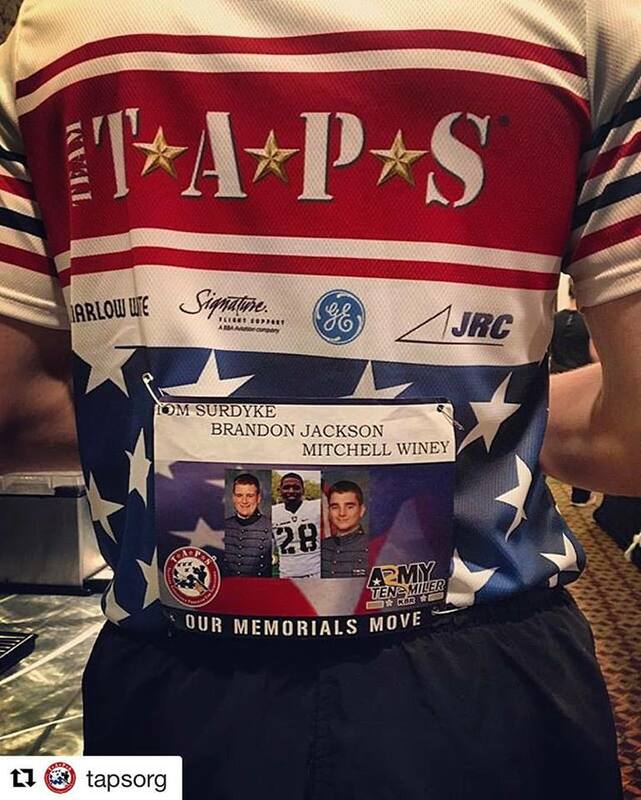 This past weekend our fallen cadets were honored at the Army Ten Miler. Thank you to @tapsorg @mdw_usarmy for the photo. To honor their legacies further, please visit our website and consider purchasing one of their bracelets. All proceeds will be donated to charities of their respective families' choosing. It is with heavy hearts that we mourn the loss of Cadet Brandon Jackson. Brandon of Queens, NY, was killed in a car accident on the morning of September 11th, 2016. He was 20 years old. All proceeds from the sale of the CDT Brandon Jackson Bracelet will be donated to a charity designated by the surviving family. Be thou at peace Brandon. Brandon "Action Jackson" or "B-Jack", was a beloved teammate, brother, and friend to many. As the son of an Iraq War veteran mother, his commitment to military service was more than a vocation; he carried with him the blood an American patriot. On the field, he was a young leader and embodied the warrior ethos, playing in all 14 games since his arrival in 2015, amassing 68 career tackles and three interceptions. There are no words to describe this tragic loss for our nation, only prayers and condolences for Brandon's family, the Army team, and the United States Corps of Cadets in their time of grief.